Custom fabricated aluminum window well grates fit your window well exactly and allow air-flow into your basment. Window well grates are made from high quality, rust free aluminum that is light weight for safety and easy removal. 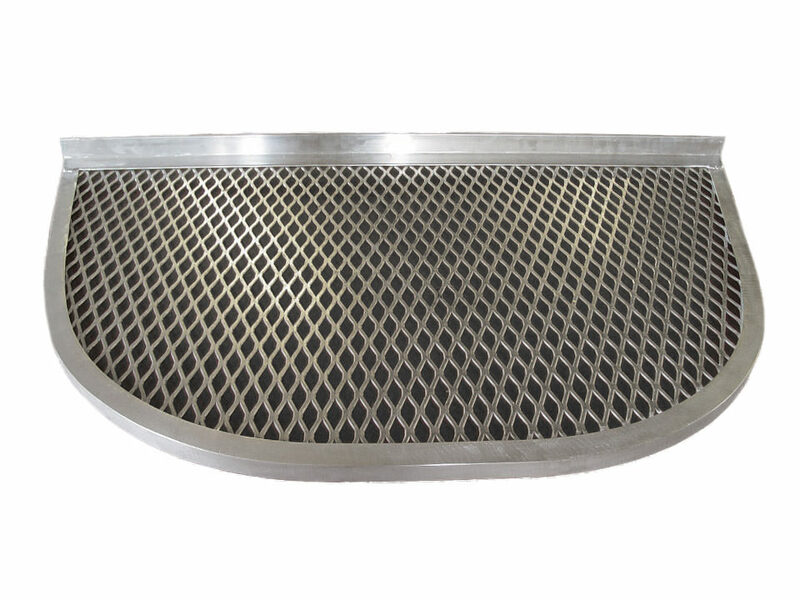 Our window well grates can be made to match any style, shape, and size of window well. An open basement window well is simply a sort of invitation to some unpleasant situations which could cause harm to your household. It can result into home accidents which are avoidable. It can serve as an “open door” to invaders and debris into your home’s basement. Our window well grate is the perfect solution to those issues. Can be custom made for all sizes of window wells, including metal, plastic composite, concrete, landscape timber, and landscape block. 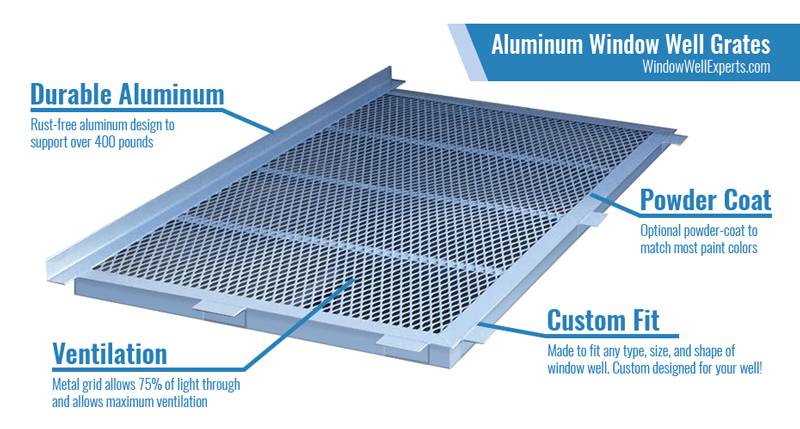 Made of high quality Aluminium: Our Window well grates which is made of high quality lightweight and rust-free aluminium is your best option when searching for an ideal cost effective covering for your window wells for an excellent ventilation in your basement. Sturdy and Rugged: This product is built to withstand extreme tension and weather conditions. It can comfortably support up to 400 lbs weight.Therefore, it can comfortably withstand both kids and adults stepping on it without imploding. Custom Made: This product can be custom made for you depending on your requirements in design, style , shape and dimensions. Our custom designs include metal, plastic composite , concrete, landscape timber and landscape block. 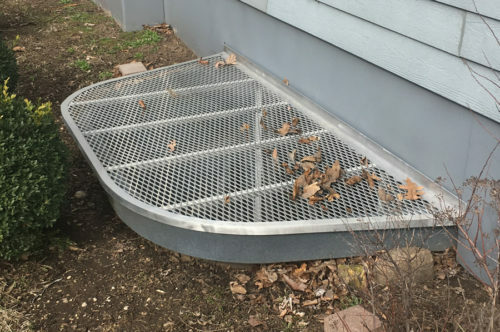 Supports proper airflow: This window well grate is designed with proper ventilation in mind, allowing normal air passage into and out of the basement but blocking unwanted elements like debris and invaders for entering. Buy With Peace Of Mind: Your satisfaction is our priority and we are ready to travel extra miles in an effort to ensure that you are 100% satisfied with every purchase you made from us. We are equipped with state of the art technology to give you the best in terms of quality. What a great fit!! You couldn’t have done a better job if you had manufactured it here on site, right on the patio! The installation looks clean, so it appears to be a truly professional design and installation. They just came in and are fantastic. Below are photos of one of mine installed and one of me (6’0 and 235lb) standing on it. Fantastic product, very impressed. We love our new window well grate cover! Great fit and my customers love them.